If you like this free game, try Lost in Night. Discover the ruins of a glorious civilization beneath the waves in Lost in Reefs, an amazing puzzle game that lets you play the way you want! Humans and dragons once lived together and created a magical city of their own. When a devastating earthquake sent the city to the bottom of the sea, the dragons and their secrets sank with it and became the stuff of legend. Choose from three great ways to play and puzzle your way to the heart of the city. Click on groups of three or more in Group Mode, swap pieces to make matching groups of three or more in Swap Mode, or string together matching icons in Chain Mode. 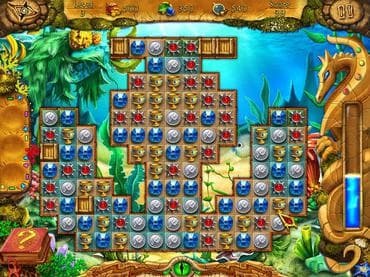 Play your way in Lost in Reefs. Free Game features: - Three Great Ways to Play; - 20 Masterpieces to Discover; - Relaxing Atmosphere; - Soothing Soundtrack; - Incredible Graphics. If you have questions about Lost in Reefs game, please contact us using this form.